Pam Brackett stands in a grove of pine trees planted by her father at Chewonki Campground in Wiscassett in 2014. In a split vote, the Wiscasset Board of Selectmen on Tuesday authorized Town Manager Marian Anderson to execute and sign an easement with Chewonki Campground that will pay the campground owners $280,000 in exchange for allowing dozens of tall trees to be cut down. The easement will allow the adjacent Wiscasset Airport to remain compliant with Federal Aviation Administration safety regulations. It also puts to rest any thoughts of the town using eminent domain to take the 25- to 70-foot conifers and deciduous trees — as well as 20 towering white pines — hand-planted by owner Pam Brackett’s father along the campground’s main road. The Federal Aviation Administration has said for years that failure to cut trees on about 3 acres at the campground — Brackett already granted an easement on 1 acre years ago — and install navigation lights on the 47-site campground would jeopardize future federal funding not only to address safety concerns at the airport, but also for other MDOT projects. 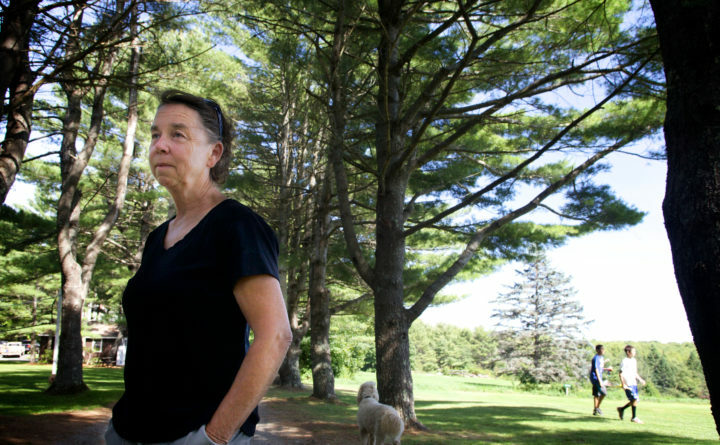 Campground owners Brackett and her sister, Ann Beck, have opposed any easement for four years, arguing that cutting the tall pines and other trees at the 47-site campground would destroy shaded tent sites and much of the appeal of the shoreside campground. Brackett’s attorney, Jim Hopkinson, wrote to the town in May that his client would consider an easement for the price of $320,000, plus a number of conditions including a “No Fly Zone” and a new septic system to accommodate more RVs, because the campground would no longer be as attractive to tenters. In July, Brackett described the easement as including the trees that cover half the sites at the campground the two inherited from their father. She said the town made them an offer, “but it’s not even close” to acceptable. Board chairwoman Judith R. Colby, Selectman Robert Blagden and Selectwoman Katharine Martin-Savage approved the motion, while vice-chairman Benjamin Rines and Selectwoman Kimberly Andersson opposed the motion, Anderson said Wednesday. “The agreement for the easement was a long process and emotional not only for the town but also for the owners of the campground,” Colby wrote in an email Wednesday afternoon. “None of the Board of Selectmen wanted to take the easement by eminent domain and the agreement was negotiated with representatives of all parties. Rines and Anderson did not immediately reply to a request for comment Wednesday. Both Brackett and Beck were at Tuesday evening’s meeting, but neither chose to speak, according to Anderson. Brackett could not be reached for comment Wednesday. Their attorney, Hopkinson, did not return a request for comment Tuesday. The town expects the FAA to pay 90 percent of the $280,000, with the Maine Department of Transportation and the town each paying 5 percent, or $14,000. That $14,000 expenditure by the town must go before voters in a November referendum. Anderson said the motion authorized her to forward documents to attorneys to draft final language for the easements, which both parties have agreed to sign. The agreement prohibits the town from cutting trees during the campground’s season, which ends on Columbus Day weekend. Anderson said the town must still send the project out to bid, and that the cutting may not happen this year. Also in part of the agreement, Anderson will recommend that the airport adopt a voluntary noise abatement procedure and send letters to known frequent pilots using the airport to notify them of the procedure. In addition, if the campground owners decide within 18 months that its septic system must be expanded because they have converted some tent sites to accommodate RVs, the town would present the question at a town meeting for a vote, and the campground would pay for the expansion. “I think I can say confidently that all parties are satisfied with the agreement and are glad it’s come to an amicable end,” she said.